I’ve fallen into a serious artist blockage on every level, I haven’t drawn anything (except for the occasional strips ofc) since the beginning of June, and I can’t write either. 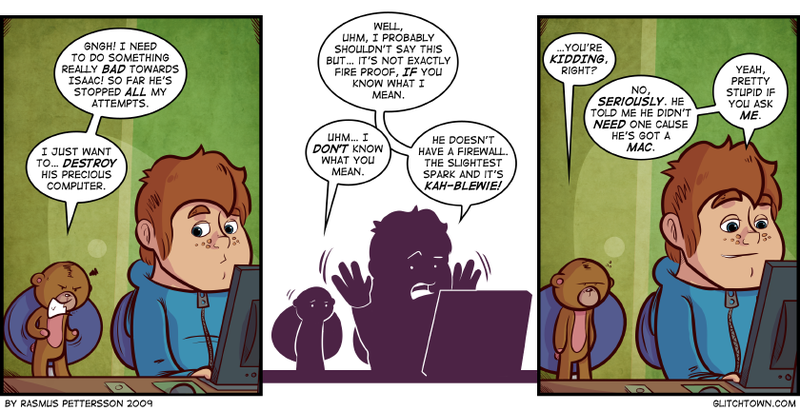 However, I ustreamed some of the making of this strip, and even though it barely worked, it was kinda fun. I wish I could do it more often. That might actually get me to draw again. This entry was posted on Friday, July 3rd, 2009 at 10:06 am and is filed under Comic. You can follow any responses to this entry through the RSS 2.0 feed. Both comments and pings are currently closed. Don’t worry mate, everyone has downtime. Just chill for a few weeks, see if you can find your center again. Dude, thanks Darky. That means alot.